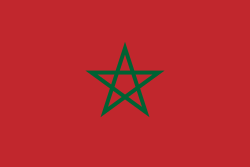 The flag of Morocco was adopted on 17 November 1915. It has a red field with the green pentagram, a five-pointed linear star. This page was last changed on 26 November 2018, at 00:26.